Electron transfer flavoproteins (ETFs) serve as specific electron acceptors for primary dehydrogenases, transferring the electrons to terminal respiratory systems. They can be functionally classified into constitutive, "housekeeping" ETFs, mainly involved in the oxidation of fatty acids (Group I), and ETFs produced by some prokaryotes under specific growth conditions, receiving electrons only from the oxidation of specific substrates (Group II). 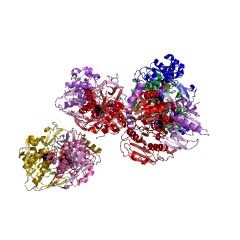 ETFs are heterodimeric proteins composed of an alpha and beta subunit, and contain an FAD cofactor and AMP. ETF consists of three domains: domains I and II are formed by the N- and C-terminal portions of the alpha subunit, respectively, while domain III is formed by the beta subunit. Domains I and III share an almost identical alpha-beta-alpha sandwich fold, while domain II forms an alpha-beta-alpha sandwich similar to that of bacterial flavodoxins. 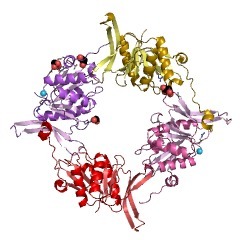 FAD is bound in a cleft between domains II and III, while domain III binds the AMP molecule. Interactions between domains I and III stabilise the protein, forming a shallow bowl where domain II resides. 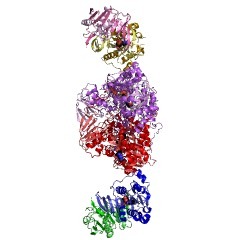 This entry represents the N-terminal domain of both the alpha and beta subunits from Group I and Group II ETFs. Electron transfer flavoproteins (ETFs) serve as specific electron acceptors for primary dehydrogenases, transferring the electrons to terminal respiratory systems. 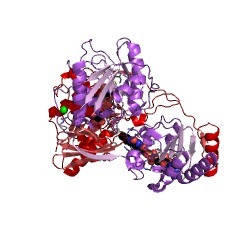 They can be functionally classified into constitutive, "housekeeping" ETFs, mainly involved in the oxidation of fatty acids (Group I), and ETFs produced by some prokaryotes under specific growth conditions, receiving electrons only from the oxidation of specific substrates (Group II) [(PUBMED:8599534)]. 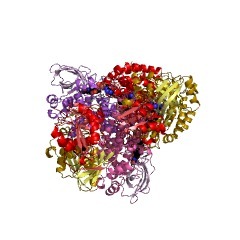 ETFs are heterodimeric proteins composed of an alpha and beta subunit, and contain an FAD cofactor and AMP [(PUBMED:2326318), (PUBMED:8525056), (PUBMED:8962055), (PUBMED:10026281), (PUBMED:12567183)]. ETF consists of three domains: domains I and II are formed by the N- and C-terminal portions of the alpha subunit, respectively, while domain III is formed by the beta subunit. Domains I and III share an almost identical alpha-beta-alpha sandwich fold, while domain II forms an alpha-beta-alpha sandwich similar to that of bacterial flavodoxins. FAD is bound in a cleft between domains II and III, while domain III binds the AMP molecule. Interactions between domains I and III stabilise the protein, forming a shallow bowl where domain II resides. 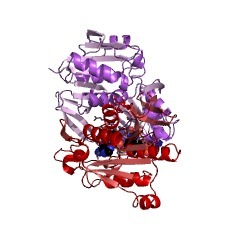 This entry represents the N-terminal domain of both the alpha and beta subunits from Group I and Group II ETFs. There are 43531 ETF domains in 43388 proteins in SMART's nrdb database. Taxonomic distribution of proteins containing ETF domain. This tree includes only several representative species. The complete taxonomic breakdown of all proteins with ETF domain is also avaliable. Click on the protein counts, or double click on taxonomic names to display all proteins containing ETF domain in the selected taxonomic class. 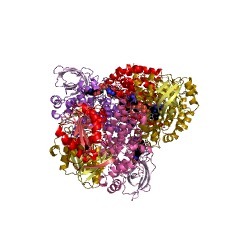 Three-dimensional structure of human electron transfer flavoprotein to2.1-A resolution. Mammalian electron transfer flavoproteins (ETF) are heterodimerscontaining a single equivalent of flavin adenine dinucleotide (FAD). 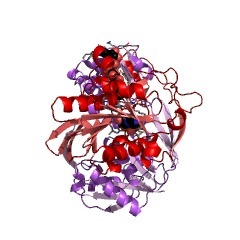 Theyfunction as electron shuttles between primary flavoprotein dehydrogenasesinvolved in mitochondrial fatty acid and amino acid catabolism and themembrane-bound electron transfer flavoprotein ubiquinone oxidoreductase.The structure of human ETF solved to 2.1-A resolution reveals that the ETFmolecule is comprised of three distinct domains: two domains arecontributed by the alpha subunit and the third domain is made up entirelyby the beta subunit. The N-terminal portion of the alpha subunit and themajority of the beta subunit have identical polypeptide folds, in theabsence of any sequence homology. 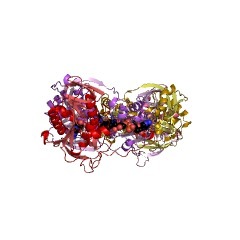 FAD lies in a cleft between the twosubunits, with most of the FAD molecule residing in the C-terminal portionof the alpha subunit. Alignment of all the known sequences for the ETFalpha subunits together with the putative FixB gene product shows that theresidues directly involved in FAD binding are conserved. 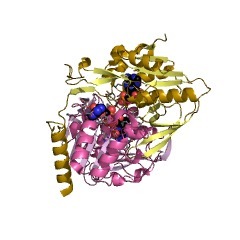 A hydrogen bondis formed between the N5 of the FAD isoalloxazine ring and the hydroxylside chain of alpha T266, suggesting why the pathogenic mutation, alphaT266M, affects ETF activity in patients with glutaric acidemia type II.Hydrogen bonds between the 4'-hydroxyl of the ribityl chain of FAD and N1of the isoalloxazine ring, and between alpha H286 and the C2-carbonyloxygen of the isoalloxazine ring, may play a role in the stabilization ofthe anionic semiquinone. With the known structure of medium chain acyl-CoAdehydrogenase, we hypothesize a possible structure for docking the twoproteins. Bradyrhizobium japonicum possesses two discrete sets of electron transferflavoprotein genes: fixA, fixB and etfS, etfL. A group of four co-regulated genes (fixA, fixB, fixC, fixX) essential forsymbiotic nitrogen fixation has been described in several rhizobialspecies, including Bradyrhizobium japonicum. The complete nucleotidesequence of the B. japonicum fixA, fixB and fixC, genes is reported here.The derived amino acid sequences confirmed the previously noted sequencesimilarity between FixA and the beta-subunit and between FixB and thealpha-subunit of mammalian and Paracoccus denitrificans electron transferflavoproteins (ETF). Since the classical role of ETF is in beta-oxidationof fatty acids, a process unrelated to nitrogen fixation, we rationalizedthat B. japonicum ought to contain bona fide etf genes in addition to theetf-like genes fixA and fixB. Therefore, we identified, cloned, sequenced,and transcriptionally analyzed the B. japonicum etfSL genes encoding thebeta- and alpha-subunits of ETF. The etfSL genes, but not the fix genes,are transcribed in aerobically grown cells. An amino acid sequencecomparison between all available ETFs and ETF-like proteins revealed theexistence of two distinguishable subfamilies. Group I compriseshousekeeping ETFs that link acyl-CoA dehydrogenase reactions with therespiratory chain, such as in the fatty acid degradation pathway. B.japonicum EtfS and EtfL clearly belong to this group. 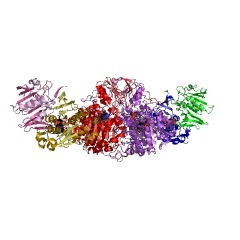 Group II containsETF-like proteins that are synthesized only under certain specific growthconditions and receive electrons from the oxidation of specificsubstrates. The products of the anaerobically induced fixA and fixB genesof B. japonicum are members of that group. B. japonicum is the firstexample of an organism in which genes for proteins of both groups I and IIof the ETF family have been identified. 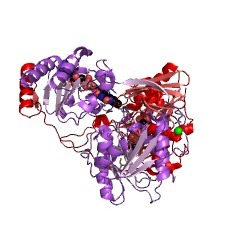 1o96 Structure of electron transferring flavoprotein for Methylophilus methylotrophus.